Women have made considerable gains in the State Legislature since the days of public scorn of women in office. By 1982 women comprised 23 percent of the total legislative membership with 35 members. The women serving today are different than their early counterparts. They are more like their male colleagues: younger, better educated, with professional and business backgrounds. The women are involved in party politics and hold leadership positions. They were no longer relegated to the position of caucus secretary. The top legislative position in 1982 was held by Senate Majority Leader Jeanette Hayner. Women represented a variety of power bases including the Chamber of Commerce, accounting firms, city and county government, and environmental groups, as well as community organization groups. Women with traditional backgrounds were now more politically sophisticated. Because of society's expanded roles for women, their legislative expertise, and growing political sophistication, women in the State Legislature were wielding more power than ever before. 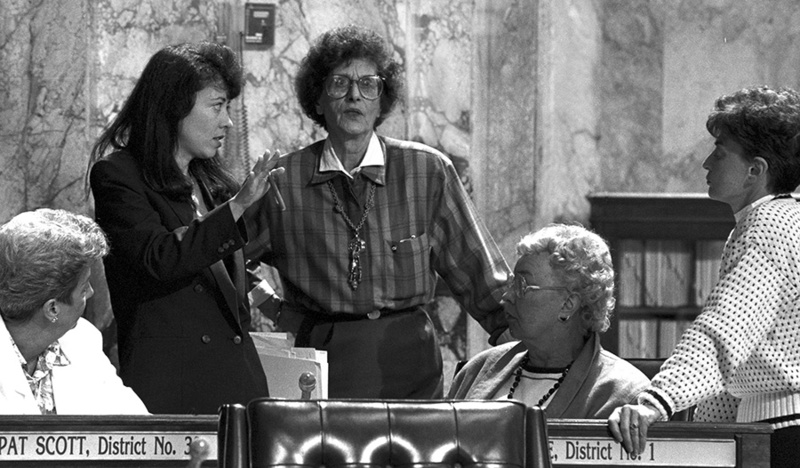 Working legislation on the House floor in 1990. From left to right: Representatives Pat Scott, Maria Cantwell, Ruth Fisher, Grace Cole, Helen Sommers.